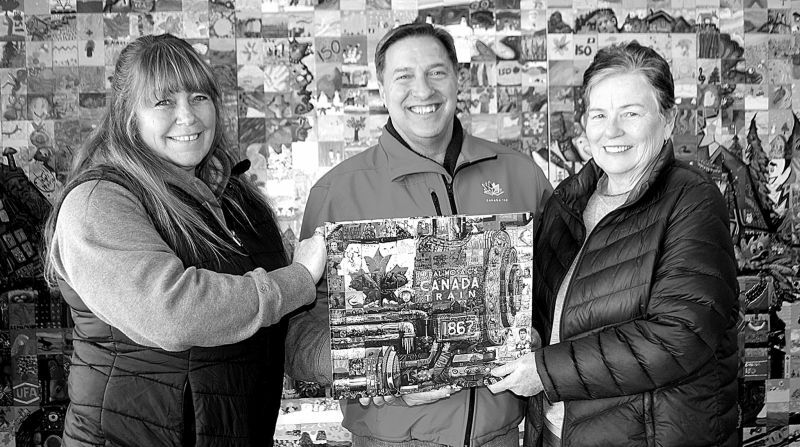 Some members of the Town of High Prairie sesquicentennial committee hold the Mural Mosaic Canada Train book that features a mural from High Prairie. Standing left-right, are chair Tammy Kaleta, Councillor Michael Long and Noela Vandermeulen. They stand in front of the 12-by-eight-foot mural inside the High Prairie and District Museum. A mural made for High Prairie to celebrate Canada’s 150th anniversary in 2017 is featured in a book. Mural Mosaic’s Canada Train book is now on sale from the Canada 150 Mural Mosaic project. The Town of High Prairie sesquicentennial committee organized the local mural for the Canada 150 Mural Mosaic project. “It puts High Prairie on the map for tourism,” committee chair Tammy Kaleta says. Murals from coast to coast are featured in the hard-covered book that contains more than 200 pages. From young children to seniors, about 350 people gathered at the High Prairie Legion Hall on Oct. 16-18, 2017 to paint 500 of the 800 squares in the mural measuring 12 feet wide by 8 feet high. Each square is 4×4″. High Prairie is one of 150 communities chosen for the project. Students from High Prairie Elementary School, St. Andrew’s School, Prairie Prairie River Junior High School, and E.W. Pratt School and Joussard School painted pieces. Seniors from Pleasantview Lodge added a flavour of the older generations and pioneers. Town council and the committee unveiled the local mural Dec. 10, 2017 at the Gordon Buchanan Recreation Centre. The mural is located inside the High Prairie and District Museum. A replica of the mural on the exterior south wall of the museum was presented June 29, 2018. Although 300 pieces were already painted to form the core train car for High Prairie, the remaining 4×4″ tiles were painted to reflect the community’s history, image and culture, including Indigenous communities. The book can be ordered online for a sale price of $55, regular $75. To order the book, please go online to www.mural mosiac.com/book.html.